In 2010, a total of 7 new stallions and 8 new mares have graded into the SPSS studbook. 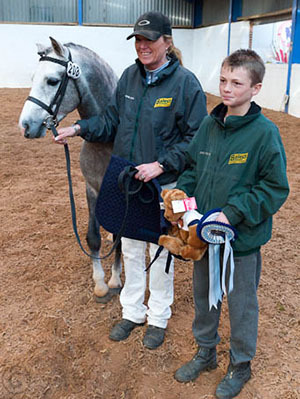 The main 2010 grading took place at: Heart of England Equestrian Centre (16th & 17th October 2010) by kind permission of the Ballantyne family. 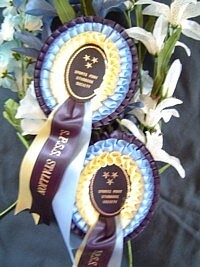 The results are given below, with links to each pony's breeding. All the stallions below passed assessment at the Main Grading in 2010 and were awarded a license for 3 years. 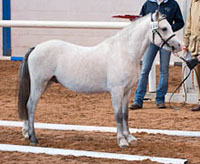 Licensed stallions have their performance and/or progeny monitored by the SPSS. The grading judges were Herr Hans-Heinrich Bruening, Mrs Celia Clarke and Mr Geoff Glazzard. 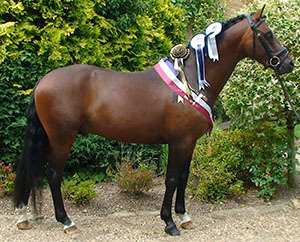 The SPSS 2010 Stallion Champion was the 4 year old Bernwode Broadway. 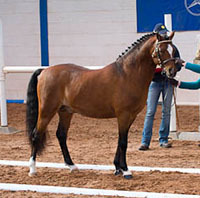 Bred by Bernwode Stud by their successful stallion Bernwode Brokat, Broadway is out of the German State Premium pony mare, Bernwode Mandy (by Apslau). Mandy's colt foal was the SPSS 2009 Youngstock Show Champion and she is dam of several other exciting young competition ponies in the UK. 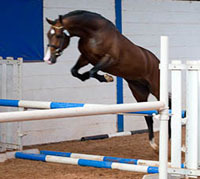 In 2007 Mandy's 6 yr old Grandson, Handsome Boy, was the Top Jumping Pony at the Bundeschampionat. 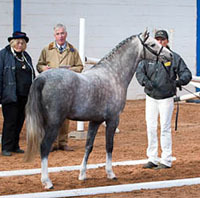 Broadway was presented for grading by Carsten Sandrock from Woodlander Stud and is the second son of Bernwode Brokat to grade with the SPSS. 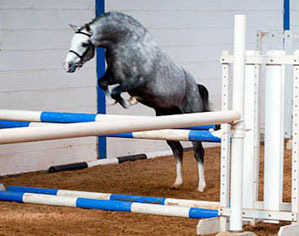 Brokat also sired the SPSS 2009 Mare Champion, Mademoiselle. Leamside Equestrian’s home-bred and home-produced 3 year old LE Chiffre was a very close runner up to the Reserve Champion and is again bred "in the purple" for a sports pony. 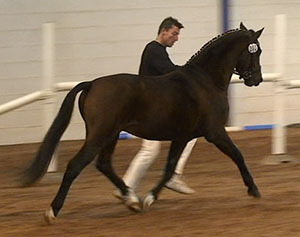 LE Chiffre was a high-scoring pony in the BEF Futurity Evaluations and is the second SPSS graded son for the Brown’s European team pony and Elite SPSS graded, Caesar 171. LE Chiffre’s dam, the SPSS head Studbook Mare Tiger Lily, was herself in-hand champion at the 2007 SPSS Show, so it is a real credit to everyone concerned to see these bloodlines also prove themselves so quickly in the next generation. For further information about all the graded stallions (including photographs) , click their name in the list below. More photos of all stallions presented can be viewed and purchased on the Buttercross Photography website - click the name to go to the site. All the mares below were graded into one of the SPSS Studbooks depending on grading score, performance record and completeness of pedigree. The judges were Herr Hans-Heinrich Bruening and Mrs Celia Clarke. At the main grading, all 8 mares forward graded and the Mare Champion was the 2 year old Bathleyhills Sea Spray. 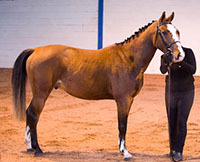 Sea Spray was bred by her owner, Penny Walster of Bathleyhills Stud and is by the Holstein stallion, Chateau De Brion, out of the Welsh Sec B, Loveden Sea Swallow (by Gigman Jacana). Sea Spray gained 77.08%. The Reserve Champion mare, Bathleyhills Marranello, was also bred by Penny Walster (who also bred the Premium Show Champion, Bathley Hills Monet as well!!). 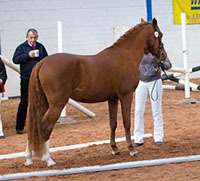 Also 2 years old, Marranello is by the Elite SPSS Graded sire, Top Yellow and out of the Dutch mare Marieke. Our congratulations to SPSS member Penny Walster on being the first person to breed the both the Main Grading Champion and Reserve Mares. Also bred by Bathley Hill Farm Stud by the Elite SPSS Graded sire, Top Yellow and out of the Dutch mare Marieke. More photos of all stallions presented can be viewed and purchased on the Buttercross Photography website - click the name to go to the site.